This blog has turned into a collection of my Frugal recipes I serve to my family. Take a journey with me and learn to make frugal Midwestern fare for your family staying within your budget. In a large mixing bowl with electric mixer, cream butter, shortening, and sugar until fluffy. Add egg; beat well. Add almond extract. Combine dry ingredients in a separate bowl, then add to creamed mixture gradually. Press cookies 1 inch apart on an ungreased cookie sheet. Bake at 350° for about 7 to 8 minutes. Cool butter cookies on a wire rack. Makes about 5 dozen almond spritz cookies. Do you want an opinion on a product? I will be happy to give you an honest product review. Email me at frugalcookingcorner@gmail.com anytime. I am a mom of two wonderful children. I also work as a nurse and am working on my master's degree in nursing. I also love to make all my own food from scratch. I have done away with all things packaged. This has been a very moving moment for me. I make all our own snacks, and food. I love living the simple life on the prairie in Iowa. (Although I live in the middle of a fairly large city) It can be done follow me to learn how! In my rare spare time I love to cross stitch, read, and sew. This blog is a personal blog written and edited by Angela Shanahan. 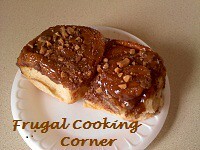 For questions about this blog, please contact frugalcookingcorner@gmail.com.